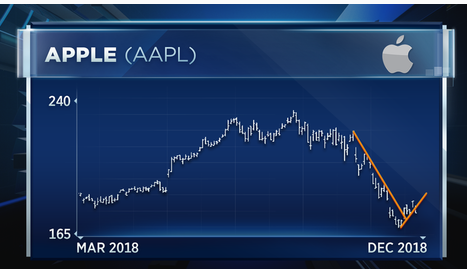 Apple was down again in Thursday's premarket and is on pace for its worst quarter in a decade. "We've seen a pretty good level of stabilization just in the last week, and the stock has risen almost 8.5 percent off those lows, so that was a real positive," Newton said on CNBC's "Trading Nation." He remains bullish on the stock long term for three key reasons: Momentum on a short-term basis is still positive, the weekly chart is oversold, and finally because sentiment has so rapidly turned against Apple. "It became not only the trade-war stock, but all of a sudden we're seeing downgrades and people are saying revenue and everything is going down ... after a 20 percent pullback the risk/reward seems favorable to buy into this weakness in the days ahead," he added. Michael Bapis, managing director of Vios Advisors at Rockefeller Capital Management, also believes now is the time to buy Apple because the stock's fundamentals remain strong. With shares at 13 times forward earnings, he likes the valuation, and he points out that despite the recent pullback, Apple is still higher for 2018. He's also projecting a 12 person earnings growth next year, which he thinks the market is discounting. Fears of peak iPhone sales has led some investors to believe that Apple's best days are behind it. But Bapis says these concerns are overblown because customers remain loyal to the company and the products it makes, and because Apple is getting an increasing portion of its revenue from software sales. "Customers are so loyal to Apple ... they're loyal to the ecosystem and that's not going anywhere. There may be a rotation going out of so many devices being sold, but their services business is growing at 25 percent," he said. "Remember in these types of markets when you buy, that's what creates outperformance, so we're going long."